A useful addition to a preventative maintenance program. ETS can carry out a thermographic scan of all areas likely to be running too hot or too cold (in the case of failed refrigeration insulation for example). Any areas of the site that register as potential too hot or too cold (be that electrical or mechanical) will be captured as thermal images and photographic images and will be included in the report. 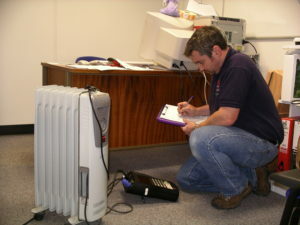 It must however be understood that thermal imaging is not a substitute for Periodic Inspection and Testing. It can however provide a useful interim back up in a maintenance program between formal inspection and testing and can complement the overall system information available to the duty holder. It can also be very beneficial in situations where access may be restricted or shutdowns to fully test are not possible. Some of our competitors claim thermal imaging to be the be all and end all, but it is not a substitute and it should never be relied upon as the sole means of fault identification in the preventative maintenance program of an electrical systems. Thermal imaging can be carried out on a site-wide basis fairly quickly and cost effectively and is largely unintrusive. However, panels and cabinets will need to be opened in order to scan the components within, this may require a shutdown of the panel to achieve. The thermal imager needs to physically see any hot item to detect it, it cannot see through solid barriers such as doors or cabinets.